… I’m not entirely sure we can be friends. Oh I’ll try, but hating on such an adorable little guy does make you just a little bit suspect. I mean just look at those adorable bat ears, and those puppy-dog bat eyes, and that fluffy little bat face. And he’s so very gentle and sweet. This is NOT the bat of horror movies and pulp fiction. What’s NOT to like about a bat eating a banana?!? 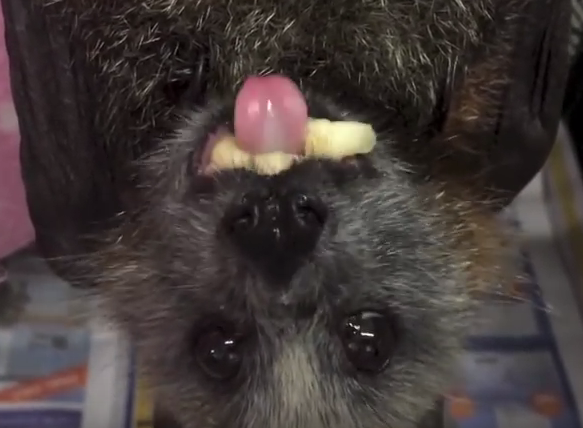 Tonto is an adult Grey Headed Flying Fox. And the poor little guy suffered an electrocution injury. 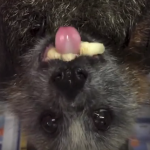 But he’s now being cared for, and fed delicious bananas, by bat rescuer Megabattie so there’s a happy ending. Grey Headed Flying Foxes are native to Australia. And shrinking habitat is threatening the species. I know, I get it. Lots of people have a fear of bats. I don’t know if it’s how they’ve been portrayed in pop culture. Or it it’s their (cute little) clawed bat feet or amazing hairless wings. Perhaps it’s just a lack of exposure in general since they’re nocturnal and not an animal most of us will ever get up close and personal with. And we always tend to fear what we don’t know.